Swiss watchmaker Marc A. Hayek cherishes those who make watches and those who love them. In this interview he talks about looking towards a global market and the surprises he faces when thinking locally and acting globally. The voice is soft, almost guarded, but the thinking is clear and far-reaching. A short lesson in globalization. At the heart of the Swatch empire, both a family and a global group, grandson Marc A. Hayek is slowly but surely spreading his wings. As deeply committed as his grandfather was, he now presides over the destiny of three luxury, prestigious brands: Blancpain, Breguet and Jacquet Droz. It is not easy to follow in the footsteps of such an inspired genius, the man who relaunched the watch industry with a brilliant, opposite tactic –a good value, mass market watch– while remaining passionate about prestige watchmaking. Marc A. Hayek is an entrepreneur who works on the global scale. 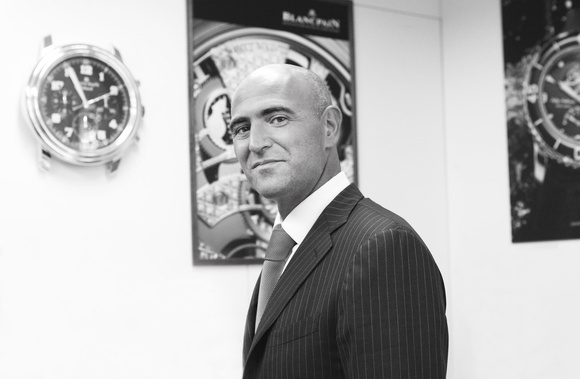 Blancpain has gone from 65 to 650 employees. Breguet is continuing to expand and Jaquet Droz is starting to show its teeth. His consuming passion is to develop their identity and their “DNA”, as he calls it. A few years ago, with two friends, you opened a restaurant called Colors in Zurich. Why did you abandon this baby in 2002 at the very moment that you were contemplating opening a second establishment in Milan? In watchmaking, as in gastronomy, there is always that exceptional product, the one you want to be part of. I’ve never been against working either in watchmaking or with the family. It’s true that I was on the point of opening a second restaurant in Milan because things were well established in Zurich and I said to myself, “let’s keep moving”. But then the Swatch Group’s offer happened and Blancpain was part of the proposal. I had fallen in love with Blancpain well before it became part of the group. It was the main reason for rejoining the family group –a completely unexpected return. A second important aspect concerned the management philosophy of the group. Swatch has always put entrepreneurial people in positions of responsibility: people capable of fully embodying the brand, while respecting the rules of the group. That allows managers the freedom to act in a spirit of initiative and independence. So, the idea was definitely not to enter a cartesian universe, deprived of this entrepreneurial spirit and the sense of responsibility that goes with it. Another important factor in my decision was to do with the human size of Blancpain: in such a structure it’s possible to be involved in the details, from the creation right through to the commercialization. So you moved from local to global status! And that has become more marked with the passing years. Today I manage three brands –Blancpain, Breguet and Jaquet Droz. As an executive of the Swatch Group, I look after the prestige and luxury range, and I supervise the markets in South America, central America and the Caribbean, without being involved in an operational capacity. The three brands are enough to occupy my day.